At K 2013, Borealis, Borouge and NOVA Chemicals invite you to “Open Your Mind” and explore exciting possibilities for innovation and sustainability driven by their new approaches and cutting-edge plastics solutions (Stand 6A43 Hall 6). These three polyolefin producers are among the world’s leading providers of chemical and innovative plastics solutions, and are under the cross ownership of the International Petroleum Investment Company (IPIC), OMV and the Abu Dhabi National Oil Company (ADNOC), who are all strongly committed to their growth. Whilst operating as separate entities, Borealis, Borouge and NOVA Chemicals will come together at K 2013 to clearly demonstrate the value created for customers through continuous investments that expand the companies’ capabilities and offerings. Innovation is at the core of each of the companies, with the common goal of making a sustainable contribution and delivering a competitive edge to customers across a diverse range of markets. This common strategy will be reflected in their polypropylene (PP) and polyethylene (PE) products and technologies presented at this year’s event for infrastructure, automotive and advanced rigid and flexible packaging applications. At K 2013 Borealis highlights include lightweight solutions for the automotive sector to reduce vehicle weight and improve overall sustainability by lowering carbon emissions. Borealis will also feature product innovations in surface aesthetics that meet manufacturers’ demands for defect-free surfaces and help them capitalise on the benefits of reduced production costs, lower environmental impact and optimised production cycle times. In addition, Borealis will showcase; a major technological breakthrough for advanced packaging applications focused on securing sustainable and long-term supply for the extrusion coating industry; a step-change innovation to promote reduction in sterilisation time for healthcare applications; and pipe materials offering higher chlorine resistance that enable the production of pipes that last at least three times longer than conventional polyethylene pipes. Borouge is committed to supplying innovative PP and PE based solutions that address the market demand for infrastructure, automotive components and advanced packaging. At K 2013, Borouge will highlight its differentiated solutions such as a new PP BorPure™ homopolymer for moulders and end-users in the food industry in the Middle East and Asia who are facing increasingly stringent processing and packaging end-user requirements. In 2014, Borouge will start up three new PE plants and two new PP plants under the Borouge 3 expansion project, and expand its commercial,logistics and supply chain networks to support its customers and the plastics value chain throughout the region. At K 2013, NOVA Chemicals will place particular emphasis on its ability to provide customers with PE solutions that get to the heart of their challenges. Inaugurated in June 2013, the Borealis Sirius Catalyst Plant in Linz, Austria, is a key factor in the growth strategy of the business of Borealis polyolefins. The construction of the catalyst plant represents an investment of EUR 100 million, which follows earlier investments of EUR 50 million in the expansion of the innovation headquarters in Linz, opened in 2009. 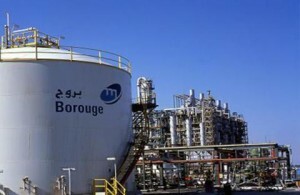 In 2014 Borouge expands its Abu Dhabi-based plant’s annual capacity of PE and PP from 2 million to 4.5 million tonnes/year (t/y) supported by a new Innovation Centre in Abu Dhabi that will collaborate with the European Innovation Centres of Borealis, as well as with local and international educational institutions to further develop new innovative market applications and solutions. Borouge is also increasing the production capacity of its Compounding Manufacturing Plant in Shanghai from 50,000 to 90,000 t/y to support the sales of compounded plastics resins for the growing Chinese automotive market, and is expanding its logistic network in China to include warehouses in Tianjin and areNingbo to complement its existing Shanghai and Guangzhou logistic hubs. At the same time, the company has opened a new representative office in Tokyo and plans to open four new offices in Bangkok, Delhi, Ho Chi Minh City and Jakarta by the beginning of 2014. To enhance its market leadership in PE quality and reliability of supply, NOVA Chemicals has begun construction of a new large-scale gas phase linear low density PE line at its Joffre, Alberta manufacturing hub in Canada. The new line is expected to be operational from late 2015 and have a capacity of about 450 kilotonnes/year (kt/y). The Corunna, Ontario cracker revamp is expected to leverage NOVA Chemicals’ access to new feedstock by converting the facility to utilize up to 100% natural gas liquids and be the first in the industry to consume ethane from the Marcellus Shale Basin to make PE by late 2013. Project completion is targeted for early 2014. For more information visit Stand 6A43 in Hall 6 at K 2013.